Wake Forest Federal is the oldest continuously operating financial institution located in Wake Forest. The Association was established in 1922 as Wake Forest Building and Loan Association and was initially capitalized by seven directors who contributed $575 in equity shares. The Association operated out of a local bank’s lobby on White Street in downtown Wake Forest during its early years. By 1930, the Association had grown to $65,500 in total assets and during the great recession was the only locally chartered bank to survive. The institution operated out of several locations on South Main and White Streets for the next 41 years. In 1963 the Association moved to its current location at the corner of Brooks and Owen with the construction of its first permanent office building. At that time, the Association served 2,000 members and had assets of $3.2 million. In 1995, the Association’s building was expanded and extensively remodeled on its original site where it continues to operate today. 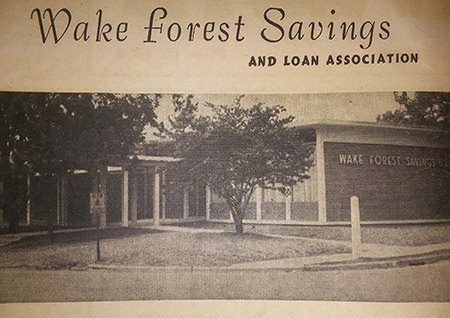 Wake Forest Federal was initially chartered as a state savings and loan association and became a federally chartered savings and loan in 1982. In 1996, the Association became a public institution and simultaneously formed Wake Forest Bancorp M.H.C. In 1998, the Association formed a mid-tier holding company, Wake Forest Bancsshares, Inc. which currently issues and holds all outstanding common stock. Wake Forest Federal is currently the only financial institution headquartered in Wake Forest. With assets now approaching $106 million, Wake Forest Federal continues to apply the same “customer first” principles that precipitated its founding almost a century ago.